Ink jet technology is becoming recognised as the printing technique of the 21st century, and within the next two decades will displace many of the current technologies for office, commercial printing, packaging printing and even newspapers. In addition it is proving to be the most flexible way of manufacturing displays, printed electronics and even replacement body parts. Pivotal Resources operates at the forefront of this technology, working for vendors and users world-wide. We assist in defining and reviewing product strategies, support the development of new products and processes, and help our clients gain market position. Our clients are based world-wide and include many familiar names. Among our services and activities are Directions, our ink jet patent review service and the Ink Jet Academy course. Mike Willis, Pivotal Resources Ltd. Founder of Pivotal Resources, Mike has worked on the development of both toner technology and ink jet printers as well as consulting for 40 years. 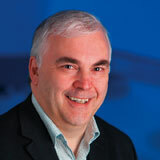 Mike specialises in ink jet technology hardware, and tracks new developments and applications. In conjunction with Dr Alan Hudd of Alchemie, Mike founded the popular Ink Jet Academy course, which has had over 2,000 attend.